Four Harker students joined five other team members for the local USA Ultimate championship tournament. 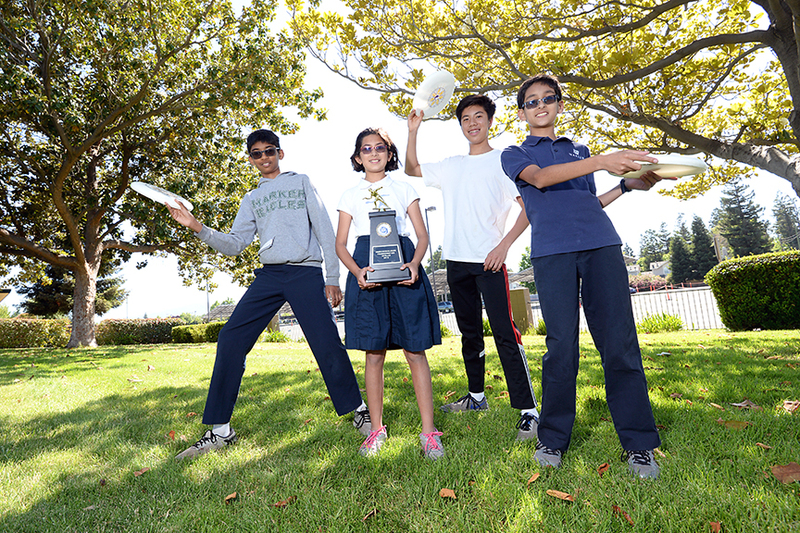 Harker students Brian Harder, Athreya Daniel, Johnathan Mo, all grade 7, and Leah Harder, grade 4, participated. The Bay Area Disc Association hosts an annual tournament in California for kids ages 10-14; this year the tournament was in Newark. There are no preliminary games; the teams train all season for the big event, and the work paid off for these students! In the Division II finals, the team edged out its opponent, Redwood Day School, beating it 8-6 to take home the championship trophy. A total of 24 middle school teams competed, evenly split between Division I and Division II. Teams competed from as far south as San Luis Obispo and as far north as Marin. The students send out a special thanks to teacher Rebecca Williams for being the faculty sponsor for their after-school Ultimate club at the middle school. The club activity was instrumental in allowing Harker’s competitors to play together and work on skills throughout the year. The team is coached by Alan Harder, father of Brian and Leah, who has played at the club level for more than 15 years. With three seventh graders on the team, it will be exciting to see if they can defend their title next year!